-Small and lightweight hand-pressure capsule coffee machine, easy to operate, efficient and practical, likes a small mobile cafes in your traveling, let you enjoy the fresh coffee anytime, anywhere. -Clean the hatched areas under running water to remove all remain coffee.For all others areas,we highly recommend to only use a humid soft cloth when cleaning.Do not put any Mini portable espresso machine part into dishasher. 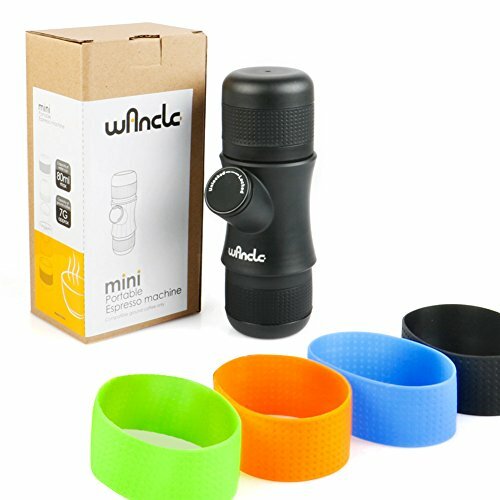 SUPER MINI,PORTABLE:The mini portable espresso machine is only palm-sized,you can use one scoop of ground coffee(7 grams)to fil the filter basket once. PROVIDE YOU ESPRESSO WITH STRONG AROMA ANYTIME ANYWHERE:You can take the mini portable espresso machine to everywhere,whenever you want to drink a cup of hot coffee,what you need is a pack of scoop. ANTI-SCALDING DEVICE:The outer sleeve of the espresso cup and water tank with soft silicone to avoid burning yourself while making coffee. MORDERN DESIGN and Fully Hand Operate:Simple and intuitive fashion design,perfectly designed for the coffee lover.no batteries, no electric power. FREE WORRY SHOPPING : we are confident with our prodcut , therefore , we offer 2 years warranty . If you have any questions about this product by Wancle, contact us by completing and submitting the form below. If you are looking for a specif part number, please include it with your message.